This is the goddess Artemis She was the daughter of Zeus and twin sister of Apollo. She was the goddess of hunting, and myths about her are often stories about hunting. Artemis was the great Olympian goddess of hunting, wilderness and wild animals. In ancient art Artemis was usually depicted as a girl equipped with a hunting bow and quiver of arrows. The goddess Artemis was always responsive to the needs of the vulnerable and the suffering. She was quick to defend the powerless from unjust treatment at the hands of the Olympian patriarchy; it is not surprising that in current times Artemis is seen as the “feminist” goddess. To be allowed to live without having to be distracted by love and marriage. A bow and arrow just like her brother’s. A hunting costume and freedom from having to dress up like a lady. The job of bringing light into the world. Sixty young nymphs to be her companions and to help care for her hunting dogs. All the mountains on the earth to live on. Even at this tender age it was clear that Artemis was going to be the most independent of the goddesses, one who thrived on challenges. Artemis’ association with the natural world and the wilderness symbolizes her own untamed spirit. The most independent of the goddesses, she roamed the forests in her role as huntress. Artemis was especially fierce in her protection of the gentle animals that were usually preyed upon. 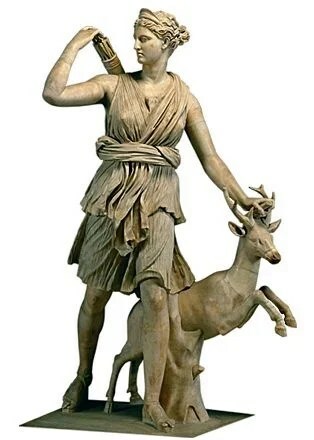 She was the protector of animals and the young Artemis was not the least interested in cultivating the land or in harnessing the forces of nature to benefit. Artemis could easily be described as an early environmentalist.